The purchase of a forage wagon has enabled Derbyshire farmer Glenn Mosley to take full control of the farm’s silage-making operation, bringing with it several claimed benefits. 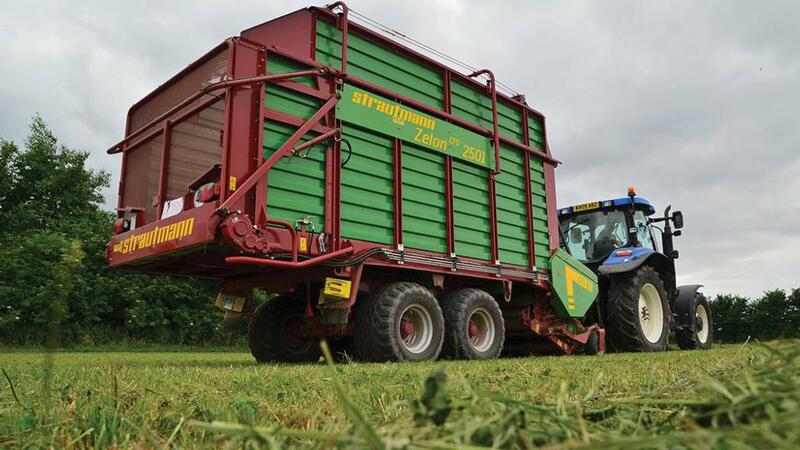 Aiming to reduce silaging costs, improve silage quality and fit in with the farm’s infrastructure, Derbyshire farmer Glenn Mosley has invested in an entry level forage wagon to take care of his farm’s harvesting duties. Based at Knotlow Farm near Buxton, the Mosley farming operation is a true family affair, with Mr Mosley’s grandparents, parents and sister all involved. The 160 hectares (400 acres) of farmland supports a flock of 800 Camtex and Texel-cross ewes, and 35 suckler cows. Silage, haylage and hay are taken off 57 hectares (140 acres), and 24 hectares (60 acres) of winter barley are grown to supplement the diets of 400 beef cross dairy calves which are bought in and finished each year. Mr Mosley also grows four hectares (10 acres) of potatoes and supplies local pubs and shops. The 133ha (330 acres) of grassland on the farm is a mixture of permanent pasture, less favourable land which is reseeded every 10-12 years, and 48ha (120 acres) of better quality land which is sown with medium term multi-purpose grass mixtures and rotated with the arable crops. Mr Mosley explains: “We try to have clover in the leys, but we also need to control the thistles and nettles. There is no time in the spring for reseeding, so fields are reseeded in late summer/early autumn after the barley harvest. “We let the grass come, and then spray off the weeds. Then in the second year of the ley, straight after cutting, we stitch clover in with a tine harrow and seeder. The soil is warm then, the grass short, and the sward more open, so this works well. “The fields are shut up in the first week of May, after taking the sheep out. About 36ha (90 acres) is cut for pit silage, and a further 12ha (30 acres) is made into round bale haylage for the youngstock. Mr Mosley says: “Our silaging contractor used to come with a tractor and trailed forage harvester, and we would also hire a trailer off him. I would do the mowing and then the carting, and dad would be on the clamp with the buckrake. 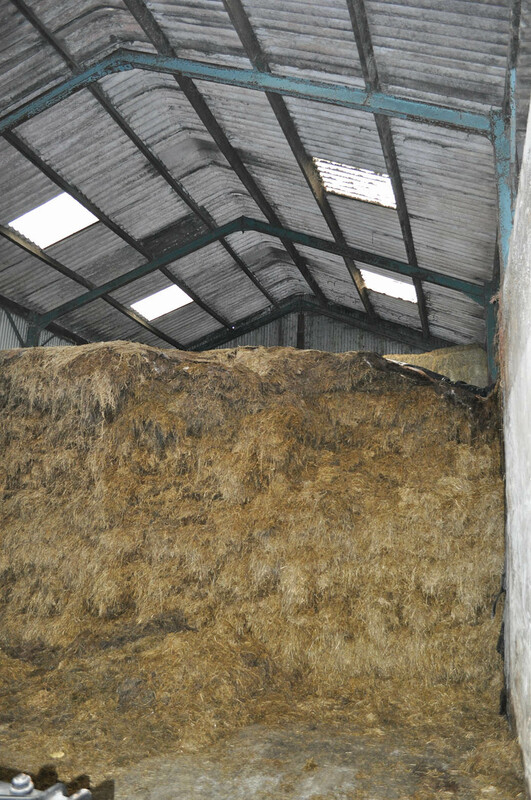 However, with just one silage clamp inside an old hay barn, albeit an extended hay barn, the tight constraints of the clamp and yard do pose a challenge, says Mr Mosley. A change in the contractors’ equipment soon began to highlight the clamp and yard’s limitations. “About five years ago, our contractor bought a self-propelled forage harvester, but we stuck with the trailed forage harvester, as we would not have been able to keep up with the buckraking,” he says. “Three years ago, the trailed harvester was swapped in for a large forage wagon, but it brought the grass in too fast for us. The contractor had to sit and wait for grass from the last load to be moved. “We really needed two buckrakes, or at least a bigger machine to keep up with consolidating between the loads – but there was not the room. With costs mounting, it was a time for Mr Mosley to rethink the silaging processes. “We considered whether to build an open clamp, but that was not straightforward, and there was no obvious site except where the current clamp was,” he says. After careful consideration, Mr Mosley decided to take control of the situation and buy a smaller forage wagon for the farm. “We wanted an entry-level machine that was simple to use, well made and reliable,” he says. Mr Mosley looked at a couple of forage wagons, eventually opting for a Strautmann Zelon 2901, from his local dealer. This is the smallest machine in the range with a loading capacity of 27cu.m (actual volume) and its 105hp requirement made it suitable for his New Holland TM120. Mr Mosley was particularly drawn to the machine’s set-up and design of the double-sided cutting knives. “I wanted a shorter chop length, and with 32 blades, the Zelon gives a 44mm chop,” he says. “I also like the fact the knives are reversible. The manual recommends sharpening them after 12 hours of use, so I can do a day’s work on one side before needing to turn them over. With about only 40ha (100 acres) to be cut each year, Mr Mosley reckons the Zelon’s work can be done in five days. “It will have paid for itself in eight years and I plan to keep it for many more years, so there is a big saving in the long run,” he explains. Timeliness is also a big bonus, points out Mr Mosley. “Our contractor had always been very good at coming out when we called,” he says. “But the weather can turn quickly and it is good to have our own kit so we can just go off and do a bit at a time. “We have increased the acreage cut by 10 acres, but reduced the tonnage per acre because of taking an earlier cut which will be better quality. When we were paying the contractor on an acre rate, we wanted as much grass as we could – but actually there was no benefit in this approach. “Last year’s silage was higher in dry matter, looked and smelled good, and the stock have done well on it. “Nowadays, we never mow more than we can pick up the next day. We only want the cut grass left for about 24 hours, and no more than 36 hours. So I might go and mow a couple of fields and just have 20 acres to pick up the next day. “Ideally, I’ll mow late morning, ted in the afternoon, row up the next morning, and then go in with the Zelon later that day.